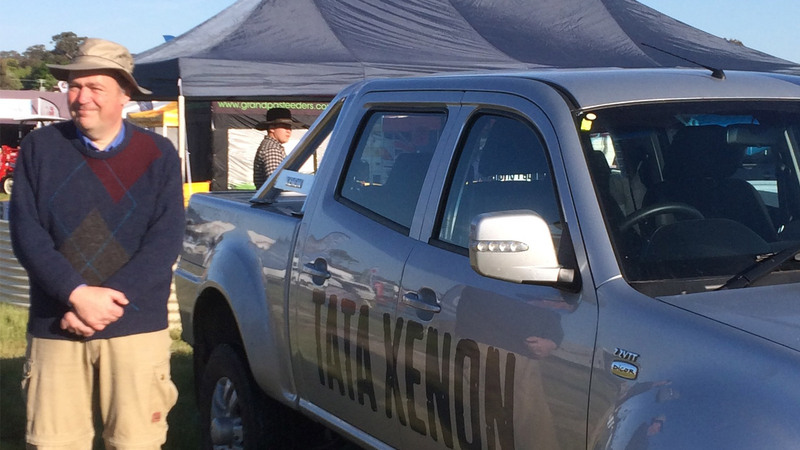 Pictured: Professor David Morris in Boorowa with the Tata Xenon. Local identity Professor David Morris has expanded his flourishing agricultural equipment sales and service business with the addition of the Tata Motors brand. Professor Morris, who is one of the world’s leading cancer surgeons, and developer of anti cancer drugs, has appointed Tony Luxford to manage the family owned business. Tony and his team are selling the Tata Xenon range from the Lachlan Valley Way showroom to serve customers in Boorowa and surrounding districts including Yass, Young, Cowra, Crookwell and Parkes. Tata Motors is Australia’s newest light commercial vehicle brand with the Xenon Cab Chassis, Single Cab Pick-up and Dual Cab Pick-up range and a choice of 4x2 or 4x4 drivelines. With a one tonne payload and 2500kgs towing capacity, the Xenon is proving to be a favourite with farmers, commercial operators and tradies. Priced from just $16,990, the Tata Xenon range has a powerful and fuel-efficient four-cylinder turbo diesel. All models boast a one-tonne payload and towing capacity of 2500kgs making them a favourite with tradies, farmers and commercial business operators. Professor Morris takes up the story of how the dealership came to be, “We’ve had a farm in the Boorowa area for over 20 years and recently started importing and selling tractors, including some built in India. “With the quality and range of products that India now produces, we heard that Tata Motors was coming to Australia and were keen to establish a dealership. Famers want reliability, low operating costs and minimal downtime with their machinery and that’s where the Tata Xenon fits the bill”, added Professor Morris. Fusion Automotive Managing Director, Mr Darren Bowler said - “We are delighted to welcome Professor Morris and his Tata Motors in Boorowa dealership. They are a tremendous asset to our expanding dealer network and I know our customers in the Lachlan Valley will benefit from the highest levels of customer service and satisfaction from all the staff at Tata Motors in Boorowa”. Boorowa and can be contacted on 02 6227 2290.